This article is about the football player. For the musicians, see Erik Turner and Eric Turner (singer). 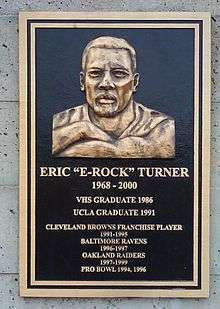 Eric Ray Turner (September 20, 1968 – May 28, 2000) was a safety who played for the Cleveland Browns, the Baltimore Ravens and the Oakland Raiders. He died of stomach cancer  at the age of 31, two weeks after claiming he was not gravely ill. He was buried at Ivy Lawn Memorial Park in Ventura, California. 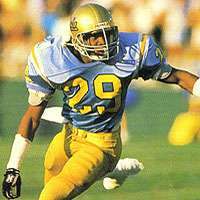 Turner attended Ventura High School and then played college football at UCLA where he was an All-American in 1990. Nicknamed "E-Rock" by his teammates, Turner drew comparisons to former Bruins great Don Rogers. He was the 2nd overall pick in the 1991 NFL Draft—the highest choice for a defensive back in football's modern era (technically the highest since Jerry Stovall in 1963). Originally drafted by the Cleveland Browns, signed a four-year, $6 million contract, which included a $3.15 million signing bonus, making the first-year compensation a record for a National Football League rookie. After the Browns moved to Baltimore in 1996, Turner played one more season for them. He made his second Pro Bowl and was second on the team with 112 tackles and tied for lead with five interceptions, although those numbers went largely unnoticed on a defense that allowed 441 points, third-highest in the league. Following the 1996 season Turner, who had the most expensive contract among all NFL safeties, was cut by the Ravens and became an unrestricted free agent for the first time in his six-year career. Turner signed a four-year, $6 million deal with the Raiders in 1997. Turner recorded 30 interceptions in just 109 career games, including returns for touchdowns of 93 and 94 yards. In 2001 he was named to the Ventura County Sports Hall of Fame. The football field at Ventura High School is named in his honor. ↑ "Eric Turner dies at 31", Sports Illustrated, May 30, 2000 . ↑ Henson, Steve (November 5, 1987), "An `E-Rock' of Ages: Former Ventura High Standout Is a Smashing Success at UCLA", Los Angeles Times . ↑ "Turner Signs With Browns", New York Times, July 15, 1991 . ↑ Lambrecht, Gary (March 1, 1997), "Ravens cut Turner, add salary room", Baltimore Sun . ↑ "Eric Turner Joins Raiders", New York Times, April 25, 1997 .